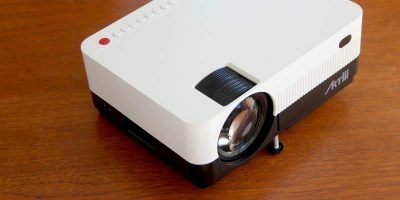 If you’re someone who does a lot of outdoor activities, plays a sport, and/or frequents sporting events, an action camera is the best option when it comes to documenting the action. Not only are they compact, rugged, and waterproof, but they also have a wide lens that allows you to get a lot more into the video/picture. 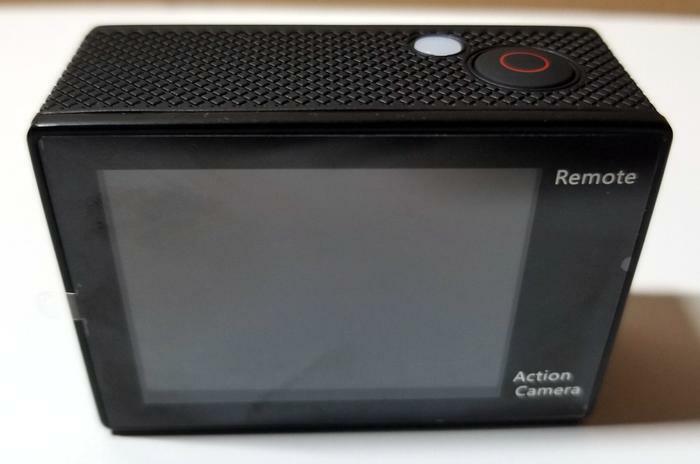 The most popular action cameras are those by GoPro, but sadly, not everyone has the money for one – or even other top brands. 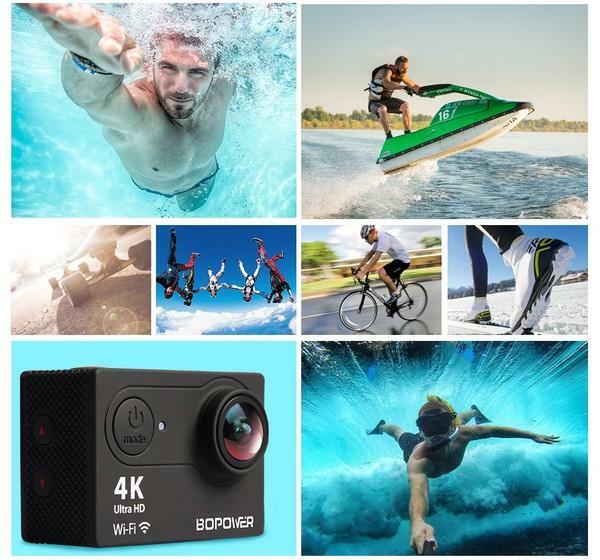 If you’re looking for a viable option that is affordable and doesn’t skimp on features or quality, you’ll definitely want to take a closer look at the Bopower 4K Action Camera. 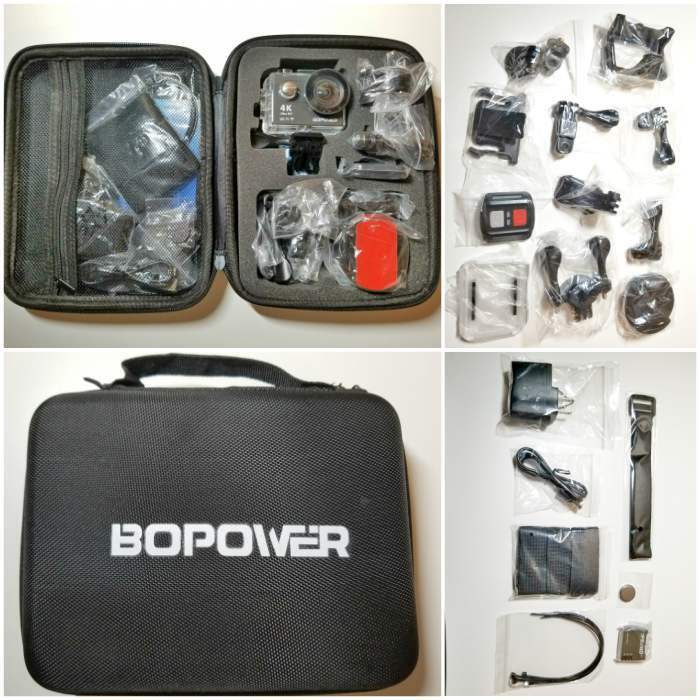 The Bopower 4K Action Camera comes in a hard shell storage case that conveniently houses the camera along with various accessories. 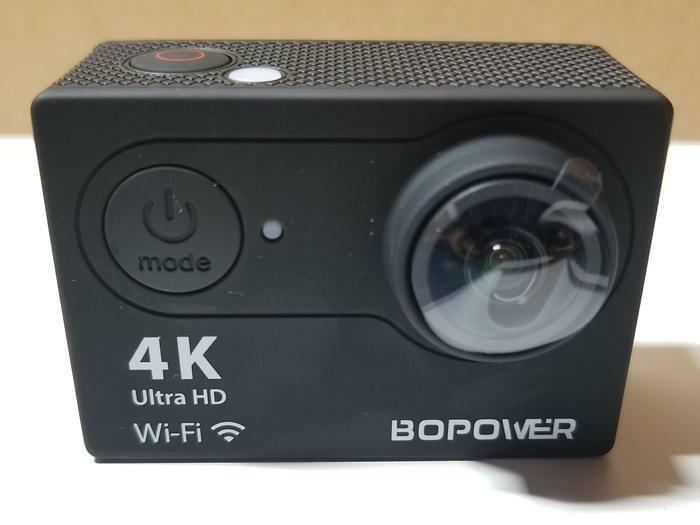 The Bopower 4K Action Camera is so small that you can fit two of them in the palm of your hand. 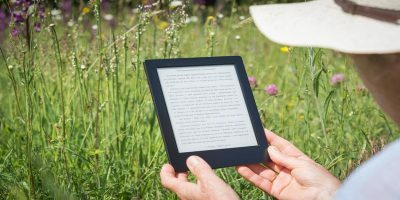 This makes it extremely portable and easy to take anywhere needed. If you don’t want to carry the entire case with you, it can easily fit in your pocket. 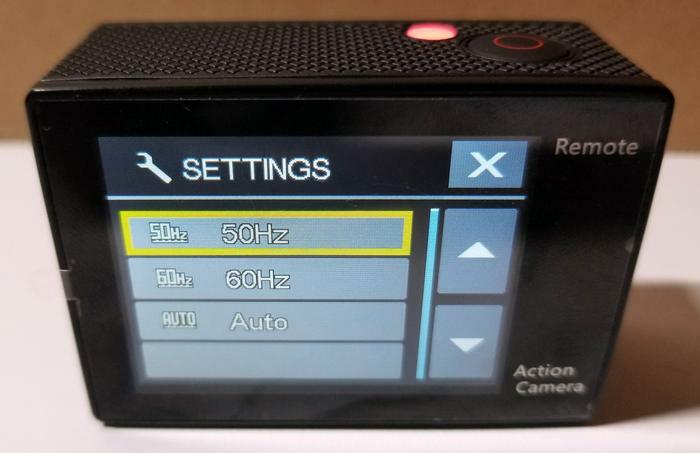 The camera also features a unique exposure function that lets you easily control the brightness by adjusting the EV (exposure value). 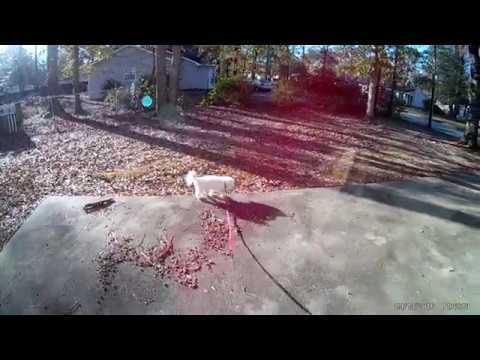 This makes it easy to capture video or pictures in both bright and dark environments. All of the included attachments and accessories give you lots of flexibility when it comes to how you can use the camera. For instance, you can mount it on a tripod, selfie stick, bike, helmet, you name it. 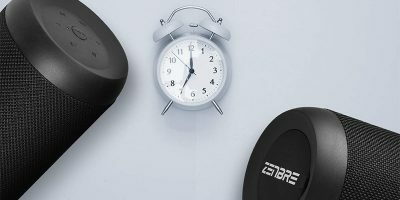 Since the Bopower 4K Action Camera is basically a GoPro knockoff (size and style), that means that it can also fit all its accessories. 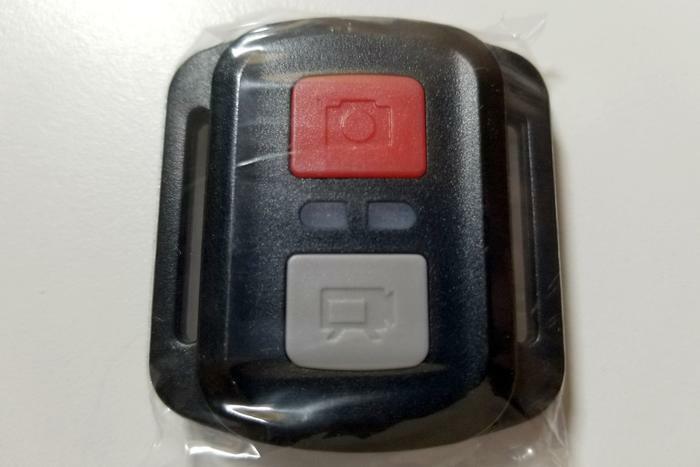 So if you need something like a chest or head mount, suction cup mount, etc., you can purchase those made for the GoPro camera. 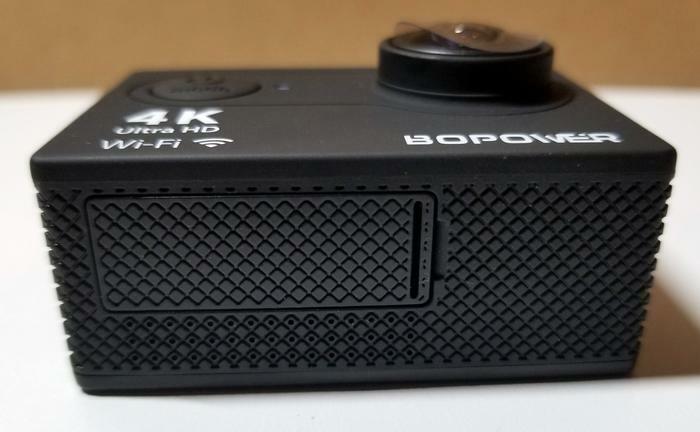 The Bopower 4K action camera has a 170-degree ultra wide lens on the front and a 2.0″ display on the back. On the front you’ll also find the charging status light and power/mode button. On the top there is a shutter/select button and power indicator. On one side are up and down buttons that double as playback (up) and WiFi (down) buttons. On the other side, there’s a microphone, microSD slot, micro-USB port, and micro-HDMI port. On the bottom there’s a little door that opens up to reveal the battery. If you plan on using the camera in or even near water, it’s best to use the included waterproof housing. There’s a secure latch that is used to open up the case and lock it in place. There are also four buttons: power/mode, down/WiFi, up/playback, and select/shutter. Honestly, navigating and using the camera isn’t too difficult until you get to the Settings menu. That’s when remembering which button does what can get a little confusing – at least, the first few times. Once you choose the mode that you want to use (normal/video, normal/photo, burst, time-lapse, settings), it’s just a matter of pressing the shutter button to start. One thing that can get a bit tedious is choosing each mode. Cycle through them by pressing the power/mode button on the front. However, it only cycles forward, so if you happen to pass by the one you want to use, you have to cycle all the way through the options to get back to the one you want. Being able to cycle backward or go back one would be really convenient. The settings are the first thing I always go to when setting up a new device, app, or software, so I was eager to see what was available here. 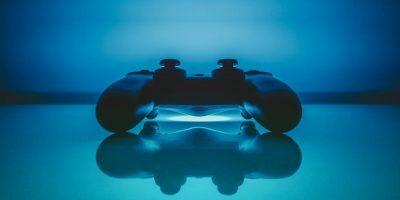 Unlike choosing a mode, there are various ways to cycle through the menus, and you can go forward and backward with ease. You can use the power/mode button or the up/down arrows on the side of the camera to cycle through the menus. 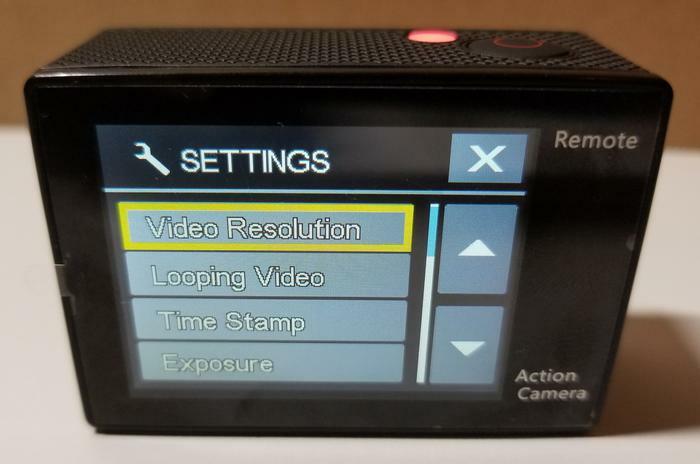 You’ll find video resolution, looping video, exposure, photo resolution, time lapse, continuous lapse, power frequency, language, sound indicator, power saver, format, and more in Settings. For video resolution you can choose 45 (25fps), 2.7K (30fps), 1080p (60fps or 30fps), or 720p. For photo resolution you can choose 12M, 8M, 5M, or 4M. For time-lapse you can choose 2s, 3s, 5s, 10s, 20s, 30s, or 60s (s = seconds). It’s important to note that before you can do any type of recording or picture taking, you will need to insert a memory card (not included); the camera does not have internal storage. 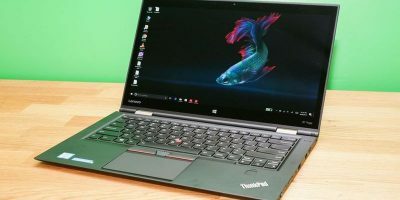 It supports up to 128GB microSD, microSDHD, and microSDXC cards. From there you just point and shoot. When done, press the shutter button again to stop. 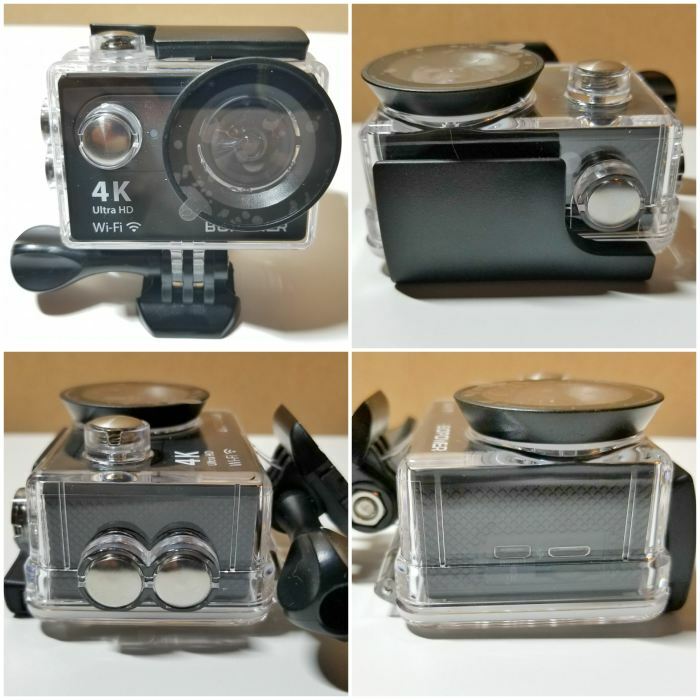 Since this is an action camera, you’re getting a fisheye effect which makes things look farther away than they really are and is intended to create a wide panoramic or hemispherical view. You can easily play back what you’ve recorded or view pictures you’ve taken by pressing the up arrow on the side of the camera and selecting the desired item. If you want to control the Bopower 4K Action Camera remotely using a smartphone or tablet, you can do so with the help of the EZ iCam mobile app (Android and iOS). 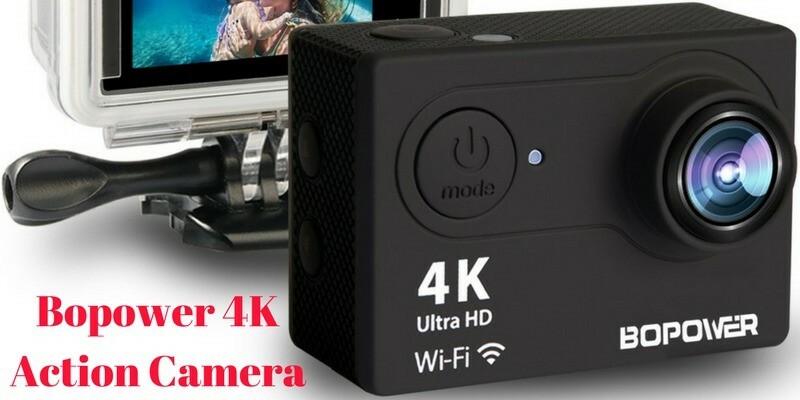 Unfortunately, though, it doesn’t work for 4K or 2.7K video, making it best for taking selfies and group photos. 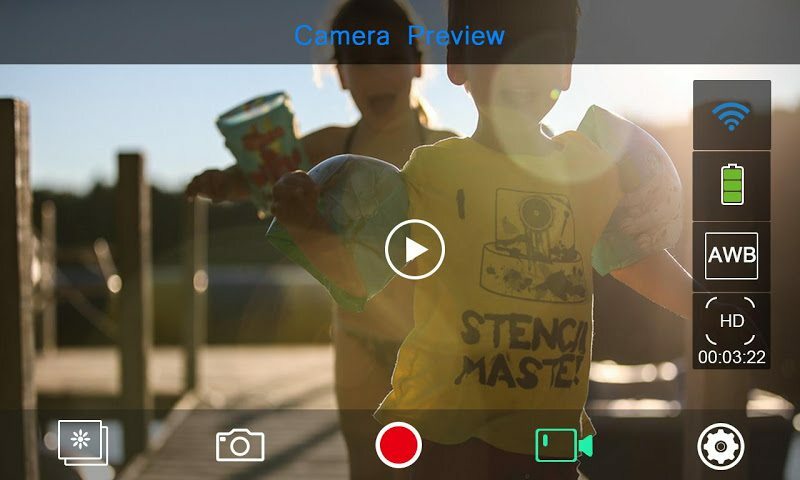 Features include full camera control, live preview, photo playback, sharing content, and more. To get started, press the down arrow button on the side of the camera to turn on WiFi. 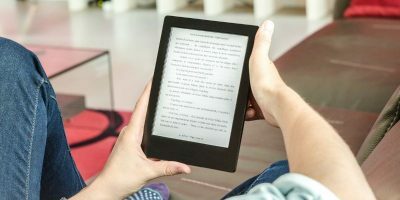 Then, connect your mobile device to the camera’s network called “ICAM-B1W.” The password needed is included in the instruction manual. To turn off the WiFi, press and hold the down arrow button for three seconds. Alternately, you can use the included 2.4G remote control to start/stop recording video along with taking pictures. Simply navigate to the desired mode on the camera and then press the grey button for video and the red button for photos. Power off the camera by pressing and holding the red photo button. 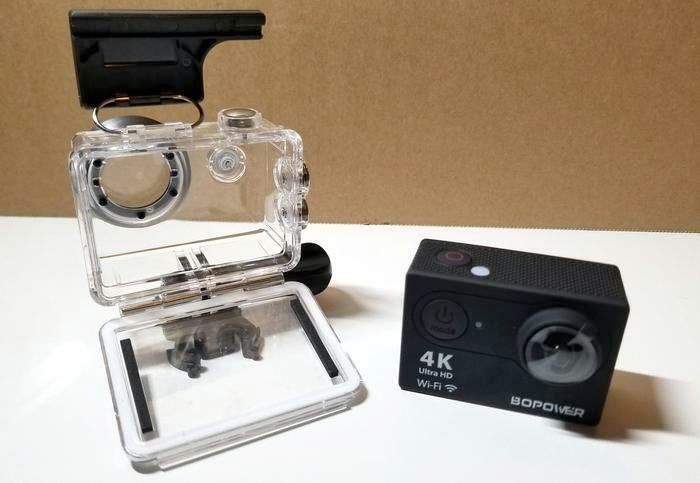 The Bopower 4K action camera is perfect for those who want an action camera but don’t have the funds for an expensive one such as the GoPro Hero. 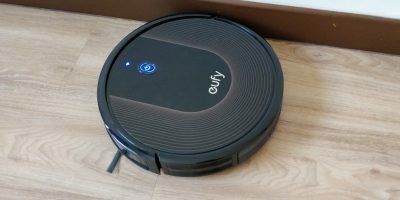 It can do most of the same things and even uses the same accessories. With 4K quality, tons of customization options and shooting modes, a handy remote control and companion mobile app, and lots of included attachments, you can’t go wrong. 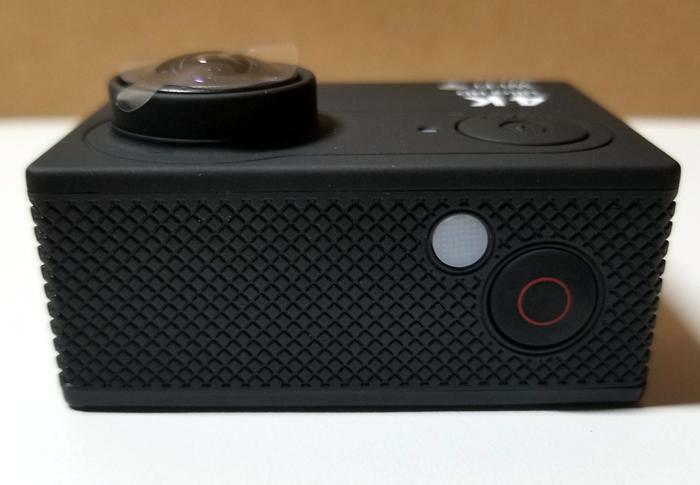 Looks like a great little camera. This kit your giving awAy looks so awesomely cool. Thanks for the Chance to win. 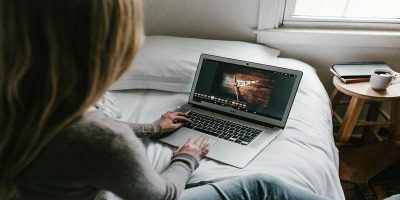 No special software is needed – Windows Explorer works fine to get files off the camera and on to your WinPC and there is a variety of free software such as VLC media player which can be used for video playback. Does the remote control work underwater? Want to use the camera on holiday attached to a snorkel and would like to control it remotely.